For over 10 years, Fence Company Boca Raton has provided south Florida with standard-setting quality, customization, and affordability. Our amazing fencing company provides both residential and commercial consumers with 5-star installations, repairs, maintenance, inspections, and fencing permit services. We are known far and wide for a signature craftsmanship and attention to detail. A streamlined process of customization that adheres perfectly to every inquiry dictates our dedication to customer value. Our team of contractors, designers, researchers, and professionals are ready to help install your brand new wooden, chain link, pvc, and vinyl fencing, in addition to providing their respective repairs and maintenance. Our long list of applicable materials is sourced from various points across the globe, ensuring that you only get the best from Fence Company Boca Raton. The Top Rated Fencing Company in Boca Providing Quality Fences! 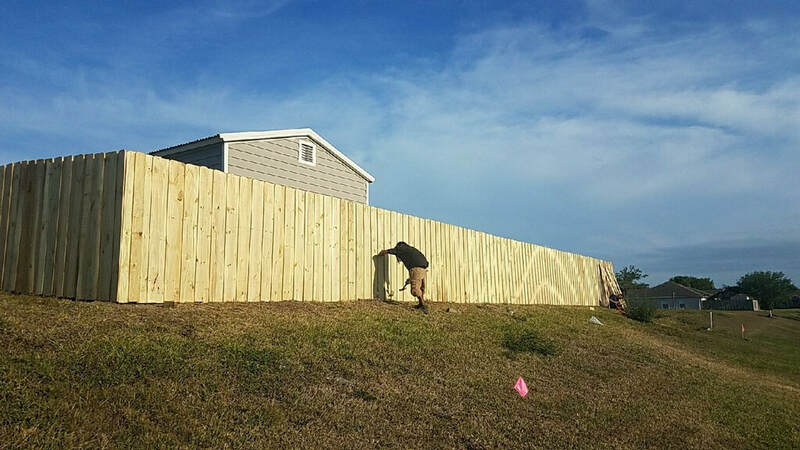 This stellar fence company specializes in providing wooden fence installations and repairs to a variety of different customer preferences and tastes. We offer contemporary styles and finishes, including our catalogue of dog-ear, stockade, and standard panel fencing. These fences allow entry-level buyers to add a new level of security to their properties without breaking the bank. Each of our contemporary installations comes standard with a finish and repair combination package. In order to sustain the longevity of your new investment, our contractors provide you with top of the line finishing work as well a 5 year repair plan that covers any and all damages caused by inclement weather and invasive wildlife. A broken fence is a useless fence – let Fence Company Boca Raton take care of you! Chain link fencing can be tricky to deal with – fortunately for you, Fence Company Boca Raton’s team of builders has years and years of relative experience. Our chain link fences, molded from galvanized steel, are lightweight and durable. They can also be built to the order of each and every buyer, meaning that the possibilities for brilliance are endless. Anti-corrosion finishing is a popular compliment to these fences because of Boca Raton’s high levels of exposure to salt and humidity. Nonetheless, Fence Company knows exactly what to do to make sure your chain link fence is the best fence in the business. Our chain link installation services are fast and efficient – our long list of commercial referrals proves that we set the standard for these types of fence company services. Chain link repair inquiries are also available through our website or over the phone! Applying for a fencing permit can be daunting, especially if you are unfamiliar with Florida’s many fence company laws, rules and regulations. Here at Fence builders, we have developed a painless, streamlined process that gets turns your fencing dream into a reality worry free. Our experts have poured countless hours into researching the fine print to get your project started quickly. Building a brand new fence doesn’t have to be frustrating with our fencing company! So, when you’re ready to commit to an amazing fence installation or repair, don’t hesitate to call ​Fence Company Boca Raton today! Our team of customer service representatives will be ready to help at a moment’s notice.